The Prime Minister mentioned reviewing and strengthening the penalties against littering at the 2013 Clean and Green Campaign. PM Lee said that though there are only a small number of Singaporeans who litter, it should be not be overlooked because these small actions can spread and it could be contagious. In the meantime, a person caught littering would pay a fine of S$300. The Clean and Green Campaign is part of the bigger plan by the Government, the Sustainable Singapore Blueprint. The plan has many programmes (like reducing carbon emission and hawker friendly centres) that seeks to protect the environment. Reprimanding littering is a start. Apart from this campaign, there is also a significant movement here in Singapore. The KSCM (Keep Singapore Clean Movement) is a national initiative that encourages all Singaporeans to shift from a “cleaned city” to a “totally clean city”. This movement is directed by the PHC (Public Hygiene Council), KSBM (Keep Singapore Beautiful Movement), SKM (Singapore Kindness Movement) and NEA (National Environment Agency). The campaign seeks to bring awareness to all Singaporeans. Inculcating the importance of a clean environment is a long journey but it should be carried out. With the partnership of many agencies, Singapore will surely be a “totally clean city”. Whether you are a citizen, PR or a tourist, you should do your best to support the campaign and other activities because it will benefit you at the end of the day. You can start by following segregation and throwing your garbage in the right place. That is not so hard, right? Good news to those who want a guaranteed spot with the best view available to watch world-class sports events in Singapore! 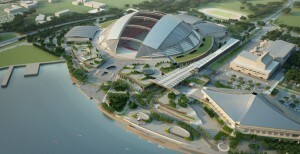 You may avail yourselves of the Premium Seats Membership at Singapore Sports Hub, which shall be up and running by the first quarter of 2014. This membership program offers sports enthusiasts and fanatics guaranteed seats in a prime location during events that will happen within the venue. Last year, the launching of Executive Suites was a success. And this time, the Premium Seats Membership is another program that will delight individuals who want an unparalleled sports and entertainment experience. The membership is priced at S$1950 per seat yearly. The exclusive seats are situated at the center sections of both north and south wings. This strategic location provides members with the best views available. If you are a member of this program, you need not worry about securing your pass ever, even for highly-anticipated events in which tickets are expected to sell out in matter of hours. You have the privilege of purchasing your ticket ahead of the public, and that should give you a great relief. Aside from that privilege, other benefits include access to the Member’s Club Lounge and entrance to the Private National Stadium. You will also be watching comfortably on a premium padded seat with armrests. There is a reserved parking area for all members, and concierge services are also included. You can preview the Premium Seats Membership at the National Stadium Club Experience Center.